Bad Sheep, Good People, Better Beer. BrewDog has done it again, producing a lovely, drinkable beer that still challenges the modern, mass market idea of a lager. Their black lager, Zeitgeist, was launched on Thursday night to a packed crowd at the Austin Gallery in Bethnal Green. Congratulations to the staff who were welcoming and well organized, as well as the entire BrewDog posse who were just good people. The gallery itself is an intimate space with a spirited mix of DIY and polish. 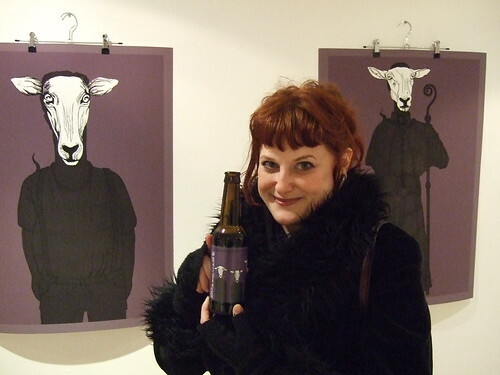 Downstairs Heather Brennan’s silkscreens for the labels were hung with clips, as if the beer and the spooky sheep-masked people had swooped into London, giving the evening the feeling of a Temporary Autonomous Zone. 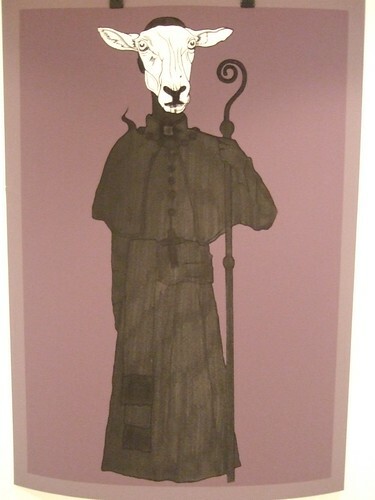 The masked everywomen/men in artwork were a little bit Wickerman, a little bit baphomet. It’s sly nod to the wolf in sheep’s clothing, an apt metaphor for a reinvented lager, which is a style made yellow and insipid by herd-market brands. But Zeitgeist is pitch black and full of flavor. The masks are off! Drinking this dark-as-night lager throughout the night contributed to this feeling that we were getting away with something. The beer was one of the prototype brews where James and Martin asked drinkers to vote for the beer they would like to see added to their range. (I was most interested in Bad Pixie, a 4.7% wheat beer brewed with juniper berries and lemon peel). I’ve been following their video blog with glee– the brewers put forth arguments for different styles and ingredients and let the readers decide. BrewDog has plans to continue this drinker-participation with their website for the Zeitgeist, where drinkers will be able to upload missives and visual subversions inspired by the beer, thus making even the marketing of the beer a collaboration between the drinkers and brewers. Portman group, I’d like to see you try to stop this! What interested me most about the beer is that it seemed to combine my own beery dilemma with elegant balance. What should I brew next? I love chocolate malt, but then I also love American-style hoppage, so as I was musing on the possibility of brewing another chocolaty mild or a daring American Pale Ale. Then BrewDog comes along and makes a lager that combines these two beloved notes– chocolate and estery Chinook hops. The highlight of the evening though was meeting James Watt, the brewer. Brewers in general are generous people who have a love of life, and James is no exception. What most impressed me about him was his passion for brewing and his sincerity. These characteristics carry through in the BrewDog beers which push boundaries while remaining trad. They’re daring while never underestimating the drinker. This is what I love about the brave guys at BrewDog: they embrace paradoxes with veracity– no surprise my favourite of their beers goes by the same name. So this post is no longer topical, being a Valentine’s post. I’ve returned from America and blame the jet lag. With the help of my friend Bob, I brewed a mild, which happens to be Mr. Malting’s favourite kind of beer. I smuggled back a very large bottle of the Blackout Mild, swaddled in bubble wrap and tee shirts and I gave it to him on Valentine’s Day. We drank it together and he said it was second only to his favourite, Harvey’s. On occasions like this I would really welcome hyperbole and maybe even some white lies (what do you mean it’s not the best thing you’ve ever tasted?) but he’s not that kind of guy. It was malty and smooth and at 3.5% it seemed really true to the style. The crisp carbonation, which I really enjoyed, seemed a slight departure. Can I reproduce another successful beer without the help of my friend Bob? It remains to be seen. I still have to buy some basic equipment, most of which I can get from Wilkinson’s down the way. But those of you that do brew at home, would you recommend an online seller?